Headaches are probably the most common form of pain experienced by people across the world. They can occur after a night of drinking, not getting enough sleep, or they can even become a chronic, reoccurring condition that can have serious effects on one’s health and can also interfere with their day-to-day lives. These conditions can range from sinus headaches, to migraines, to dreaded cluster headaches. In order to cope with headaches, many people resort to medications that, although are effective at reducing pain, come with a variety of other side effects. These side effects include fatigue, nausea, racing heartbeat, muscle weakness and many other worrying symptoms. These symptoms are so severe, in fact, that a growing number of people who suffer from chronic headaches are avoiding these medications and are instead opting for more natural, alternative options. Different types of headaches all have generally different causes. Tension headaches can be caused by tight neck, head and shoulder muscles, while sinus headaches are caused by congestion. Regardless of the cause of your headache, there is a good chance that you can get rid of it, or at least relieve some symptoms, by applying gentle pressure to certain points around your head. The center of your brow, just above the bridge of your nose. This is the part of your face where your frontal sinuses are located. When these sinuses are filled with mucus, usually during a respiratory illness or an allergic reaction, they can cause congestion, and headaches along with it. Rubbing this spot can help loosen up the mucus causing this congestion, which can lead to immediate headache relief. The cheekbones, right below each eye. This is another part of your face where sinuses are located, except these are called the maxillary sinuses. Similar to the frontal sinuses, they too can contain a build up of congestion-causing mucus. 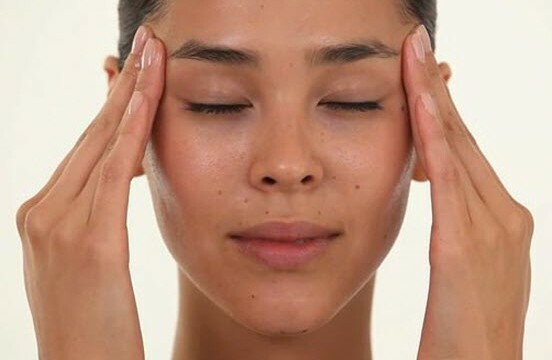 Rub these spots to help relieve additional congestion, and the headache that comes along with it. The temples. Rubbing of the temples is often synonymous with headaches, and for good reason. Muscles in the temples can become tense and tight, which can lead to headaches and visual sensitivity. To relieve headache symptoms, massage your temples deeply and rub them in a slow, circular motion. The base of the skull/top of the neck. This is the spot on the body where most headaches caused by muscle tension come from. This mainly due to the fact that most people have poor spinal posture, which leads to tightness in the neck muscles that connect to the base of the skull. The best way to relieve tension in this area is by getting a neck and shoulder massage by someone else, however you can also do this on your own through the use of a foam roller or even a tennis ball. Simply lay down on the ground, place the roller (or ball) at the base of the neck, where the tension is, and move your body up and down so that it is rolling against your neck muscles. Many health professionals, such as masseuses, acupuncturists and reflexologists make use of these pressure points to treat a wide varieties of health conditions and illnesses, including the common headache. Several studies have also shown that area-specific massaging and rubbing on the head and face has been proven reduce symptoms of chronic headaches. For more ways to reduce the symptoms and pain caused by headaches, click here.